Melissa McCarthy, 40% Off At Lane Bryant & Real Women $$$! A much beloved actress and icon for real women, Melissa McCarthy has now become a designer as well. One retailer she has joined forces with is Lane Bryant and this Labor Day you can purchase her latest offerings at 40%off using promo code: HAVEFFUNLB on regular and sale merchandise! One example is this fringe long cardigan for Fall. This style segues from Summer into Fall and adds the hot fringe so popular this season. Reg.$118, on sale $70.80. Colors are rose quartz and medium heather grey. Sizes 1X-3X. Plus earn real women dollars $25 for every $50 earned toward future purchases. Ship to local LB Store for free! MarkdownMom says if you haven’t visited Lane Bryant recently, you really owe it to yourself as they have some really hot, young, styles! bloomingdales Labor Day blow-out sale–Up To 70% Off! After Labor Day, there won’t be another super sale day by retailers en masse until Black Friday. So, in between hot dogs, football, and get-togethers, take time out to ferret out the bargains online. You will be surprise what you can find. MarkdownMom found an extra 20% off at Bloomingdale’s using promo code BIG20, that added to a third markdown on clearance resulted in up to 70% off on many items you can wear now and next year from popular designers like Ralph Lauren, Mynt, Heidi Klum, DKNY, and other favorites For instance, this kimono sweater by Ralph Lauren was orig.$150 with 20% off is now $46.80 and if you are a Loyalist Member, shipping is free. Comes in sizes XS-XL, multi, made out of cotton, linen, and acrylic. Perfect with jeans, dresses and so many upbeat combinations. Special Ladies~It's Your Sale Day! Lane Bryant has 50% off the entire store and online. Use promo code: BEMERRYLB. Ship to store FREE! This includes designer clothes by Isabel Toledo,Kyionna, DKNY, Cacique, etc., lingerie, and clearance–you name it, you buy it half off, or bogofree! Ends on XMAS EVE Ho, Ho, Ho! $2.90 each for never-before-seen colors TEN from Urban Decay–You have to be kidding! Nope, you get the blackest black, you could pay up to$20 for a good black eyeliner, + 9 other fabu colors for roughly $9- -talk about a Xmas gift! Plus free shipping! Reg. $52. Shop Limited-Time deals at Macy’s One Day Sale! Valid 12/9-12/10. Take an extra 25% off Green Monday. Today only: Promo Code Friend. Free Shipping with $50 order. 30% off sitewide Green Monday. $15 off Purchase of $60 through 12/24. Promo Code: H14A-XVPV6P9Z7Q6R. Extra 10% Off Sale Items through 12/11. Promo Code: DELIGHT. 20% Off Entire Purchase. Valid through 12/24. Promo Codes: H14DM8W9BJ & H14DM64ZBO. 40% OFF today only entire purchase + Free Shipping. Promo Code: GREEN. Valid Only 12/08. It's The 12 Days Of Giveaways From Ellen The Generous! It’s that time of the year again when the studio audience at the Ellen degeneres Show receive oodles of gifts for 12 days. Lest’ you feel left out, at home viewers can enter to win, too! Ellen this year is giving you 18 ways to enter to win, e.g. newsletter, instagram, you tube, facebook, etc. Just click here for a chance to win! Good luck! Lancôme and other expensive makeup lines seldom go on sale, but today using the promo code “FRIENDS” receive 20% off your entire purchase. Like Le Corrector Pro Concealer Kit mentioned in the December issue of allure to get rid of those unsightly dark circles. Reg. $38, with promo, $30.40 and get free shipping when you sign-up for auto renew to ship this item every 3-8 mos. Plus enjoy free samples with purchase! Save big bucks when you buy their super skin line Genifique, hailed by Hollywood Stars for its’ hydrating and firming qualities. Sale goes through December 7. Rachael Ray’s friend, Gretchen Monohan, is a source for what’s hot and new, and today she comes with items to make traveling during the holidays easier and less stressful, and you can save up to 84%. From travel size hair dryers, totes, foldable ballet flats, to lightweight rolling luggage, and more. Check it out at the Rachael Ray Show. While you are there, copy the great party cheese ball recipes–hot this holiday season! Example, get a Kenmore Elite refrigerator with an easy access Grab-N-GoTM door, reg.$4,299.99 for $2,599.99+6% cash back. Gordmans Good For Men, Women, Kids & Pets! Gordmans has come to Roseville, Minnesota and for bargain hunters this is an opportunity to save more on gourmet coffee, Rachael Ray cookware, designer shoes from DSW, handbags from Ralph Lauren and Nicole, Burberry perfume, apparel, furniture accessories and more at 60% savings. 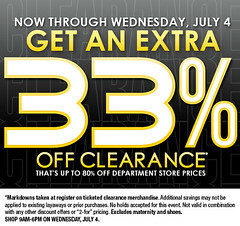 Plus MarkdownMom says save more by going to their online site for special events like their Fourth of July savings of an extra 33% off clearance and don’t forget to download their coupons! MarkdownMom, being true to her name, recently bought a pair of reg. $89/each lamps on clearance for a total of $39.98–a savings of 75%+ off! And when you go to Gordmans–and you know you will–tell them MarkdownMom sent you!